We have weekly Friday evening and Saturday morning services followed by an oneg or a Kiddush with refreshments and time for getting to know one another in the social hall. Every Shabbat we have lively discussions of the weekly Torah reading followed by a delicious vegetarian Kiddush that follows the services. We celebrate all major Jewish holidays with both religious services and other festivities, such as our annual Hanukkah party, Purim party, and second night Passover Seder. We also welcome interfaith families and provide multiple opportunities to become involved in the Jewish community. In choosing a Jewish community, always make sure that every family member is valued and respected! I believe that you will discover that we offer the kind of warmth and vitality that will engage all your senses. Don't forget to stay for kiddush! Don't forget to stay for lunch! 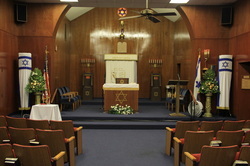 Stay up to date on all of Temple Beth Shalom's religious services and social events by checking our calendar frequently!